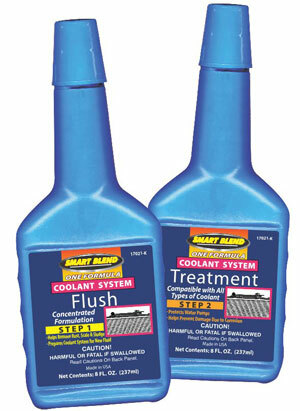 SMART BLEND SYNTHETICS, a trusted and proven leader of innovative products for the Professional Automotive Service Industry, introduces our One Formula Coolant System Flush and Treatment Kit. Step 1-Coolant Flush with a non-acid formula safely removes deposits from the radiator and coolant system. Requires no neutralizer. Step 2-Coolant Treatment helps improve coolant system performance and efficiency.